STRELNA, May 24./TASS/. 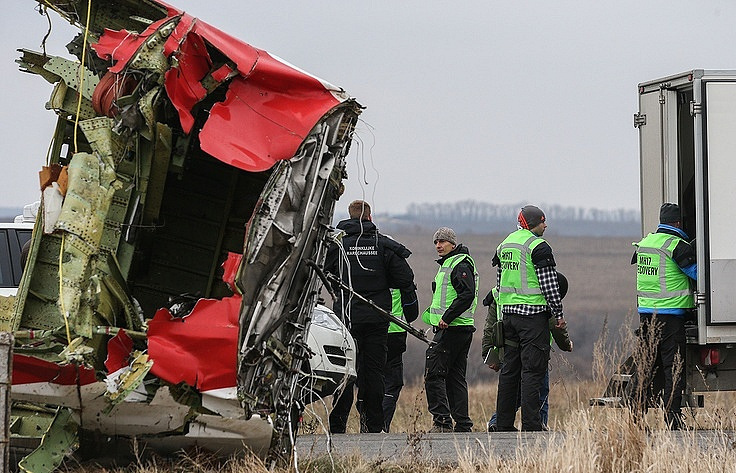 Russian President Vladimir Putin said he was at the moment unaware of the findings of the Dutch investigators on the crash of MH17 flight in Ukraine as had been working in St. Petersburg all day long, but stressed that anyway Russia must take part in the probe to accept its results. He said Russia’s stance on the issue was the following - "we right from the start suggested joint work to investigate this tragedy, but to our surprise we are kept out of the investigation," Putin said. "The Ukrainian side is working there although Ukraine violated international rules and did not shut the airspace over the territory where warfare was underway," he went on. "Russia, however - is not [taking part in the investigation]," the president said. "In order to recognize what is stated there, we must have a full role in the investigation," he said. "In any case, Russia will deal with this attentively, with respect, will analyze all that is stated there and will voice its attitude to this case," he said. "However, so far I haven’t even seen this text." French President Emmanuel Macron said his country welcomes Russia’s readiness to cooperate with the investigation. "The [Russia] president has just said a very important thing about the readiness to cooperate," he said. "I stand in full solidarity with The Netherlands and I believe that Russia should demonstrate a constructive approach."